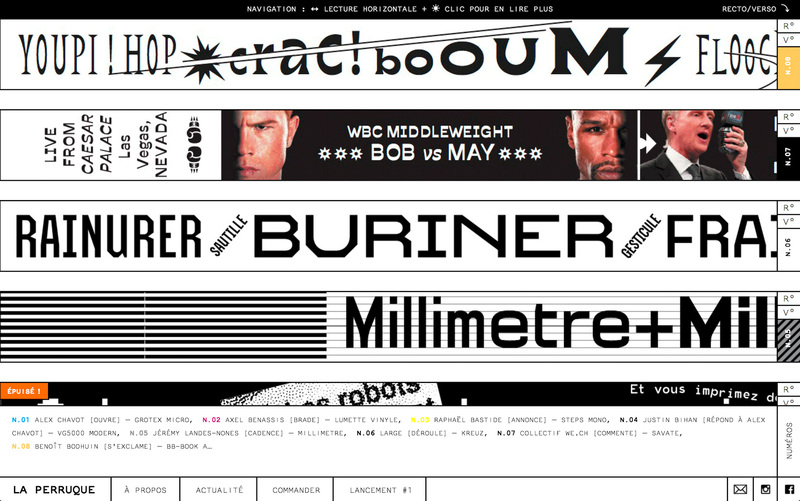 A: La Perruque is a magazine which is 1 centimeter high and 90 centimeters long and which publishes type specimens. La Perruque makes deals with printers that allow it to occupy the vacant slots in the margins of their daily prints. In fact, these strange formats are forgotten spaces gleaned from the industry leftovers. Typographically, each issue is a specimen dedicated to a typeface and all of them together draw the portrait of a typographic contemporary scene without complexes. The website is brutalist just as these strange formats are : gleaned from the industry leftovers, must be read recto/verso and with a horizontal approach.